Direct Printing is lightning fast. Category Splitting & Print Routing. Print from any device to any printer. Automatically open cash drawers	learn more. Printers require no software or drivers. 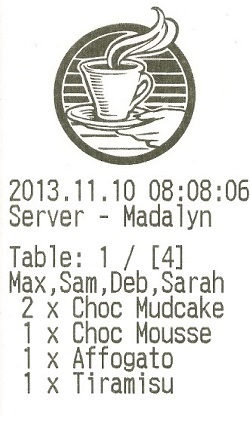 Print any cleared receipt from the ticket spike learn more. Note the Separation of Categories for the Barista and Kitchen. Single Printer and Single Push Button gives Split Separation of Orders. Collect or Delivery. Notes on the Order. Customer Information Tracked. Caller ID Search / Look Up on Phone Calls. Split Ordering / Printing / Billing. Customer Service with Separate Check Outs. 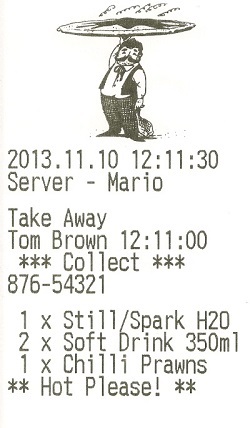 SplitAbility provides three ways to print orders and receipts. Any combination of the above printing methods can be used. Set the print options under "Admin/Printing"
Pros: Fast; Can operate while Off line; Can send the order to any or multiple printers based on category. No drivers required. Cons: None, but you do require an intelligent printer. If you have the right type of printer/s, this method provides fast printing on a Local Area Network. Print from any mPOS device that is on the same subnetwork as the printer. Direct printing can be done whilst off line. 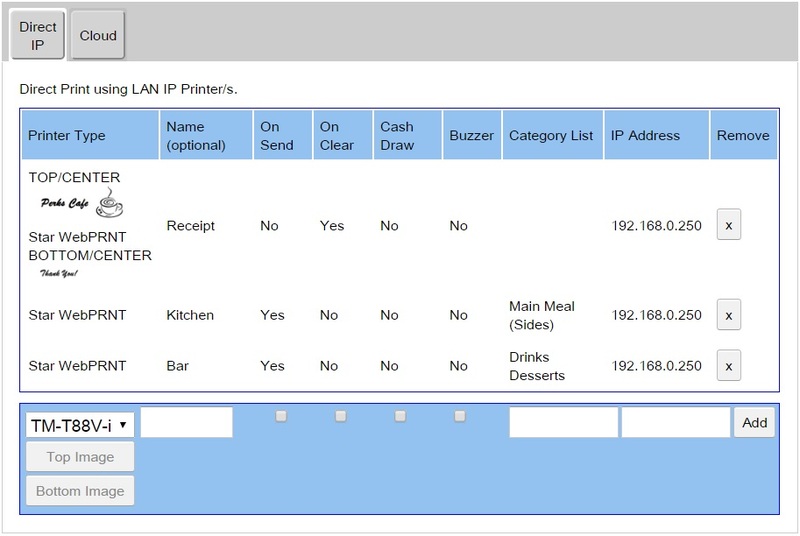 Orders can be directed to any printer with the use of a category list filter. An empty category list catches all categories. NOTE: Only printers that support IP printing can be used for direct printing. Eg. Epson TM-T88V-i , Star WebPRNT etc. "On Send" - Triggered by the "Send" button and typically used for kitchen order printing. 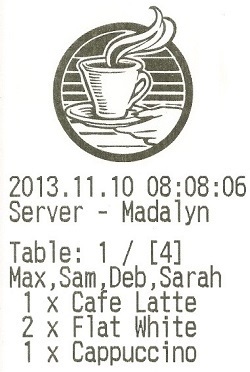 "On Clear" - Triggered by the "Print" button, shuffles the re-print buffer on clearing, typically used for customer receipts. "Cash Drawer" - Opens the cash drawer if one is attached to the printer. Can operate two cash drawers per printer. "Buzzer" - Sounds a kitchen buzzer if one is attached to the printer. "Category List" - If empty all categories are printed, otherwise categories in this list are printed. 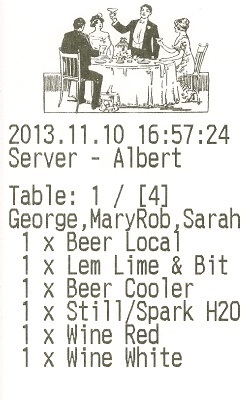 By default menu items are grouped & sorted by category on the print ticket. To add non-grouping categories use round brackets e.g. (category). Non-grouping category items also known as "Sticky Modifiers" maintain their location on the print ticket relative to the prior item in sequence. This can be useful for modifiers that are in a separate category or if sorting is not preferred. Pros: Can use any classic printer that is connected to the network. Cons: Does not work Off line. Cloud print using Google Cloud Print	where any existing classic style printer can be used. Follow the instructions here: Connect a Classic Printer and complete the steps to enable cloud printing. Enable the appropriate option/s in SplitAbility, then any device can send to the printer for faster efficient service.